Jesus said to the Jewish crowds: "I am the living bread that came down from heaven; whoever eats this bread will life forever; and the bread that I will give is my flesh for the life of the world." The Jews quarreled among themselves, saying, "How can this man give us (His) flesh to eat?" Jesus said to them, "Amen, amen, I say to you, unless you eat the flesh of the Son of Man and drink his blood, you do not have life within you. Whoever eats my flesh and drinks my blood has eternal life, and I will raise him on the last day. For my flesh is true food, and my blood is true drink. Whoever eats my flesh and drinks my blood remains in me and I in him. Just as the living Father sent me and I have life because of the Father, so also the one who feeds on me will have life because of me. This is the bread that came down from heaven. Unlike your ancestors who are and still died, whoever eats the bread will life forever." In 1263 a German priest, Peter of Prague, stopped at Bolsena while on a pilgrimage to Rome. He is described as being a pious priest, but one who found it difficult to believe that Christ was actually present in the consecrated Host. While celebrating Holy Mass above the tomb of St. Christina (located in the church named for this martyr), he had barely spoken the words of Consecration when blood started to seep from the consecrated Host and trickle over his hands onto the altar and the corporal. The priest was immediately confused. At first he attempted to hide the blood, but then he interrupted the Mass and asked to be taken to the neighboring city of Orvieto, the city where Pope Urban IV was then residing. The Pope listened to the priest's account and absolved him. He then sent emissaries for an immediate investigation. When all the facts were ascertained, he ordered the Bishop of the diocese to bring to Orvieto the Host and the linen cloth bearing the stains of blood. With archbishops, cardinals and other Church dignitaries in attendance, the Pope met the procession and, amid great pomp, had the relics placed in the cathedral. 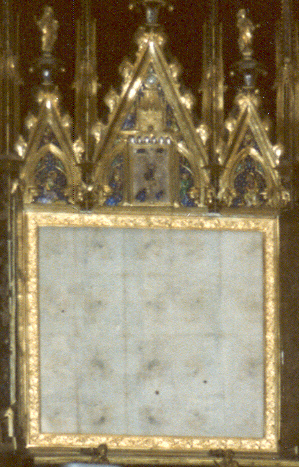 The linen corporal bearing the spots of blood is still reverently enshrined and exhibited in the Cathedral of Orvieto. It is said that Pope Urban IV was prompted by this miracle to commission St. Thomas Aquinas to compose the roper for a Mass and an Office honoring the Holy Eucharist as the Body of Christ. One year after the miracle, in August of 1264, Pope Urban IV introduced the saint's composition, and by means of a papal bull instituted the feast of Corpus Christi. To this day, in Orvieto, the miraculous corporal, which contains our Lord's blood (type AB - the universal recipient type), is processed around the town by the bishop. The procession lasts nearly three hours and meanders through the streets of the town. Each block in the town has the responsibility of decorating their stretch of the narrow streets with flower petal designs, which are then trampled underfoot as the miracle is processed through the streets. This is the Italian version of the Adopt-a-Highway Program. It is a solemnly beautiful manifestation of Eucharistic faith. We refer to this as a Eucharistic miracle, but make no mistake - every Mass is a miracle! Every time that a priest consecrates the bread and wine into Christ's actual body and blood, a miracle occurs! The miracle is two-fold: First, the bread and wine are changed into the body, blood, soul and divinity of Jesus. Second, the appearances of bread and wine remain so that nothing of bread and nothing of wine remain and yet still appear as those elements so that we can consume them. And yet, how casually many approach Holy Communion. Our manner of receiving, our manner of dress and our casual posture in approaching this sacred banquet can slowly erode our Eucharistic faith. When we don't behave and dress in accordance to what we are witnessing and who is really present, we can begin to lose our belief in the Real Presence. I experienced this at my college chapel as an undergraduate. The tabernacle was not in the sanctuary but off in a side chapel, out of the way. There were no kneelers in the church and so we never knelt for the consecration. Sooner or later, my belief in the Real Presence waned. It wasn't because I objected to it - I just was out of practice of acknowledging the fact. A friend of mine was speaking with a Muslim not too long ago and the Muslim was intrigued by our belief in the Real Presence. He said, "So, you really believe that's God?" "Yes," my friend replied. "Why do you ask?" The Muslim replied, "If we believed that, we would be face down in the Mosque the entire time - we wouldn't dare even look, let alone consume Him!" And yet, for Catholics, this is how close God wishes to draw near to us - He so willingly makes Himself vulnerable to sacrilegious communions; to indifference in the Real Presence; and to those who are not predisposed to receive. St. Paul put it so well when he said that those who consume the body and the blood of Christ unworthily become guilty of the Lord's body and blood! When we approach Communion in a state of mortal sin; or if we do not obey the Church's teachings on family planning; or if we are in an invalid marriage; or if we have not kept the hour-long Eucharistic fast, how can we truly expect God to reside in our souls? How can we have authentic communion with the Lord if we don't believe all that He enunciates through His bride, the Church? I would like to close with a story that might reawaken in us a deeper love and appreciation and ultimately, a greater sense of adoration of our Lord in Eucharistic form. On August 15, 1975, on the Solemnity of the Assumption of Our Lady, then Bishop Francis Xavier Nguyen Van Thuan was arrested by Communist authorities. His only crime was that he was a Catholic cleric. The following are his own words regarding his next thirteen years of imprisonment, nine of them in solitary confinement. "Were you able to Mass in prison?" is a question I have been asked many, many times. And when I say "Yes", I can foretell the next question, "How did you get the bread and wine?" I was taken to prison empty-handed. later on, I was allowed to request the strict necessities like clothing, toothpaste, etc. I wrote home saying, "Send me some wine as a medication for stomach paints". On the outside, the faithful understood what I meant. They sent me a little bottle Mass wine, with a label reading "medication for stomach pains", as well as some hosts broken into small pieces. The police asked me: "Do you have pains in your stomach?" "Yes." "Here is some medicine for you!" I will never be able to express the joy that was mine: each day, with three drops of wine, a drop of water in the palm of my hand, I celebrated my Mass. The six Catholics in my group of 50 prisoners tried to stay together. We lined up the boards we were given as beds; they were about 20 inches wide. We slept close together in order to be able to pray during the night. At 9:30 every evening when lights out rang, everyone had to lying down. I bent over my wooden board and celebrated Mass, by heart of course, and distributed Communion to my neighbors under their mosquito nets. We made tiny bags from cigarette paper to protect the Blessed Sacrament. At night, the prisoners took turns and spent time in adoration. The Blessed Sacrament helped tremendously. Even Buddhists and other non-Christians were converted. The strength of the love of Jesus is irresistible. The darkness of the prison turned into light, the seed germinated silently in the storm. My friends, how often we take not our our religious freedom for granted, but the fact that we can receive Holy Communion - God Himself - into our bodies in order to nourish our souls. On this weekend when we honor our veterans, living and deceased, not only should we take time to pray for our dead and to express our love for those who have served and continue to serve our nation. We should do much more - we should rededicate ourselves to rediscovering our Eucharistic faith if it has waned. If it is strong, we should pray for an increase of it so that each time we attend Holy Mass, we can recite, with ardor, that wonderful prayer: O Sacrament most holy, o sacrament divine, all praise and all thanksgiving be every moment thine. And may the heart of Jesus, in the most Blessed Sacrament of the altar, be praised, adored and loved at every moment, in every tabernacle of the world, even until the end of time.